SR-37, the Quest for 200 MPH on Batteries Dragster, is being configured with its own 1.5 megawatt power grid for 2014. At the famed Don Garlits Museum of Drag Racing in Ocala, FL, a technical team from Lawless Industries (Poland, OH) has outfitted SR-37 with a large battery-powered motor system befitting the largest name in drag racing sport. 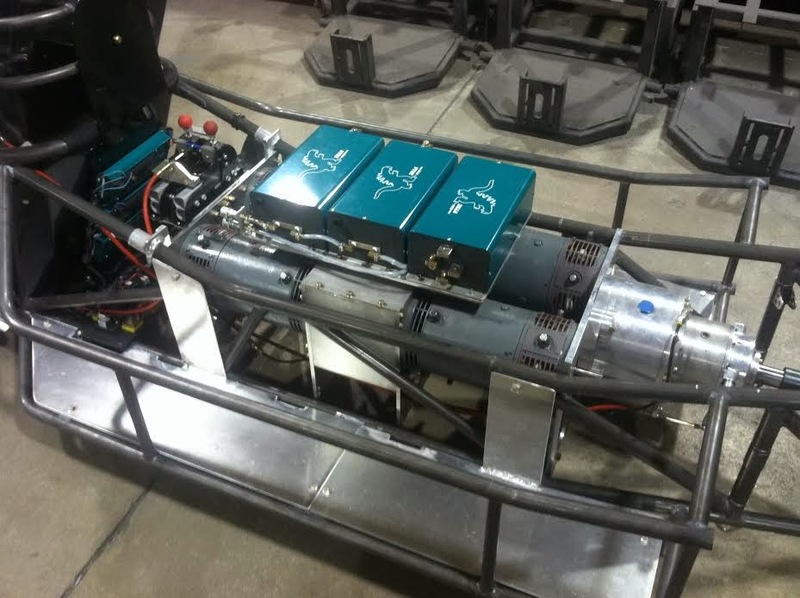 Lawless Industries, using six (6) 7.5” series-wound DC motors custom-built by General Electric and donated by Crescent Electric Supply (East Dubuque, IL), carefully modified the motor package for drag strip use in SR-37. Motors were tuned with a splined shaft for high torque output, internal motor wiring and insulation improved for high load, brush timing advanced to synchronize the 6-pack, and the package rigorously unison-tested prior to assembly into the dragster. The completed Lawless V-6 electric motor assembly has been final-fitted into the SR-37 digger’s rear engine motor compartment and engaged to the Goethe Enterprises driveline directly behind. Motor control for Big Daddy is provided by Manzanita Micro “Zilla” controllers. The entire motor package is engineered so that each motor can be driven by over 200 horsepower for a 200 MPH+, 6-second run down the 1/4 mile asphalt strip. The distinctive side pods of SR-37 will conceal the source of the massive power. A custom one-off multi-cell Lithium Polymer battery system engineered by Derek Barger/HighTech Systems LLC of Colorado will produce 1500 kilowatts (1.5 megawatts) of instantaneous launch energy for the digger, a total power source of over 2000 HP! The array is comprised of (4) packs, (2) per side pod, and operates at a peak voltage of 420V. Total battery power weight is 500 pounds, about the same as a fully dressed Top Fuel engine. The entire battery array can be fully recharged and ready for the next run in as little as 5 minutes. The SR-37 Quest for 200 MPH on Batteries BEV Dragster has it all: Big Daddy Don Garlits, 1500 kilowatts, over 2000 horsepower, starting line launch times nearly as quick as a Top Fuel dragster, energy cost per run-about 25 cents. The team hopes to commence spring testing soon with a build-up to full sub-200 mph 1/4 mile runs. The summer event schedule for record runs is being developed and will be announced during the test program.